A recent trend with Japanese beer companies is to produce a high-end brew for their portfolio. 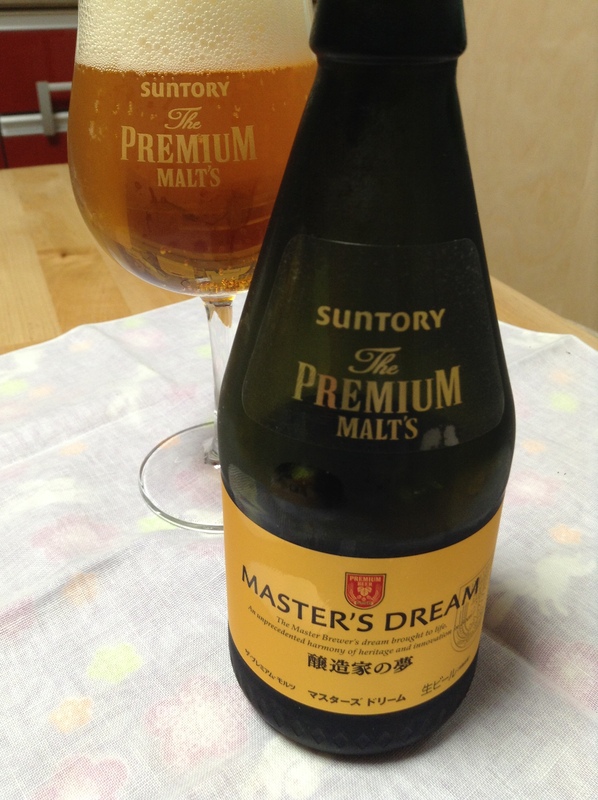 Suntory’s newest product to this category is Master’s Dream. This is a rich, aromatic beer with a nice balance of bitter and sweet notes. It is made with a traditional “diamond” malt, European hops, and spring water. I also love the packaging. It is in a glass bottle and what looks like a cap on top, but it is actually a plastic replica that doesn’t need a bottle opener. The Yaechika mall in the basement of Tokyo Station is busy during the day, but at seven in the morning it is eerily quiet. The exit out of Tokyo Station’s basement into the Yaechika mall was closed until 7 a.m. When the gates were rolled open I followed some salarymen who were walking in the same direction and came across Yaesu Hatsufuji. I was surprised to see that minutes after opening, the shop was already starting to fill up. I joined the line in front of the vending machine and picked a very traditional breakfast of salted and grilled salmon, pickles, simmered daikon and carrots, miso soup, seasoned nori, and rice. Service is quick and efficient and most diners here do not linger. 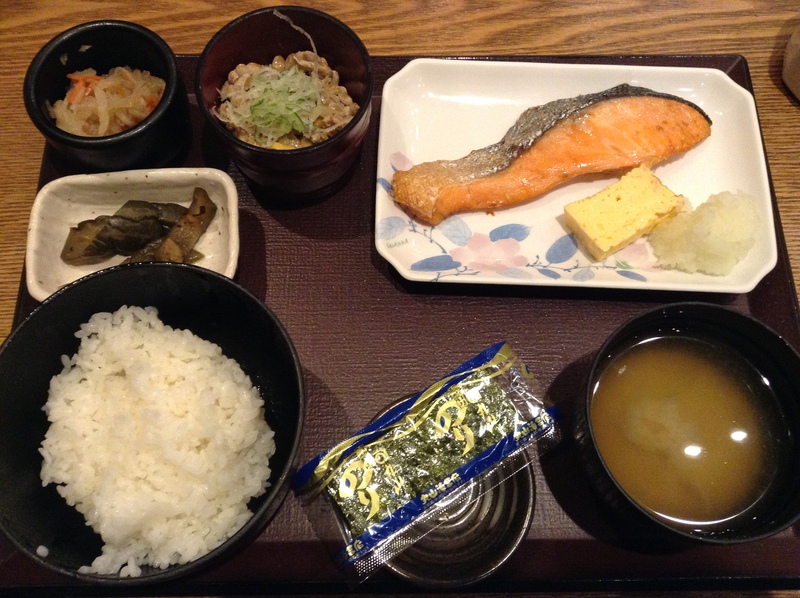 This big breakfast is cheaper than McDonald’s, costing only 570 JPY. So cheap that I splurged and added a bowl of nattō, fermented soybeans. Diners are asked to share tables. Most of the customers were male and the few women were escorted into booths. Other main dish options include meat and tofu (nikudōfu), pork miso soup (tonjiru), ginger pork (shōgayaki), and some egg dishes. I will be back. This is my new breakfast spot near Tokyo Station. Coffee is hot, hot, hot in Tokyo. San Francisco’s Blue Bottle recently opened in Kiyosumi Shirakawa and lines have been very long. Throughout the city it is becoming easier to find a great cup of coffee. 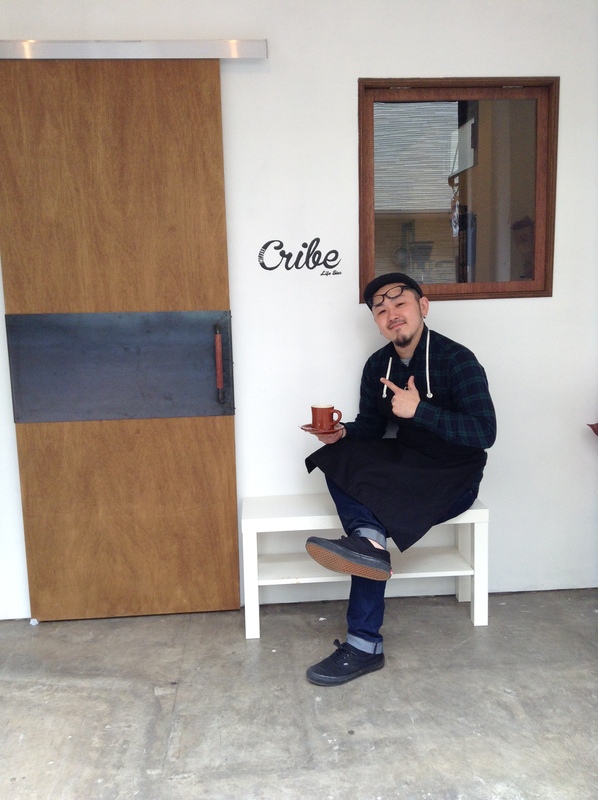 I am thrilled as my own ‘hood, Kokubunji, has its first third-wave coffee shop, Cribe. 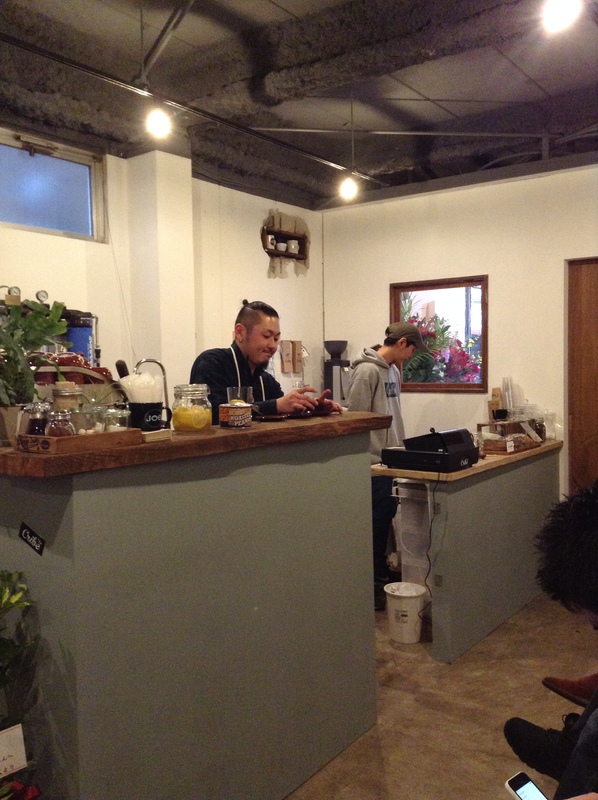 The owner, Yoshida-san is super friendly and the coffee is the best I can find on this part of the Chuo line. Cribe opens at 7:30 a.m. and is open until 9:00 p.m. There is beer for late night visitors. The shop is small and has some benches along the wall and a small seating area in the back of the shop. Yoshida-san is serving sandwiches and doughnuts from a local shop. I asked him how he picked Kokubunji to open a coffee shop and he said that he went to university in the area. I am thrilled. This is an original coffee drink called Betty. It is a generous pour of cold milk topped with espresso. 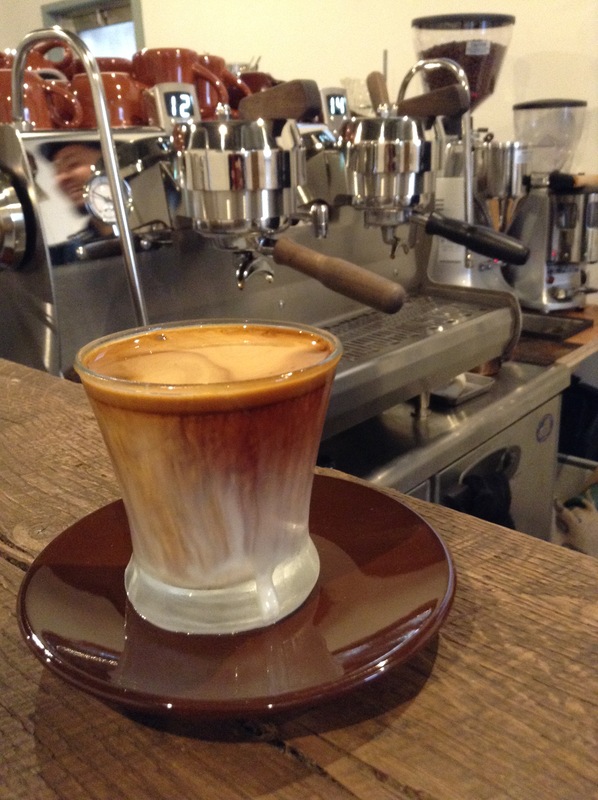 Can you see Yoshida-san’s reflection on the espresso machine? Great smile. And his Betty puts a smile on my face. 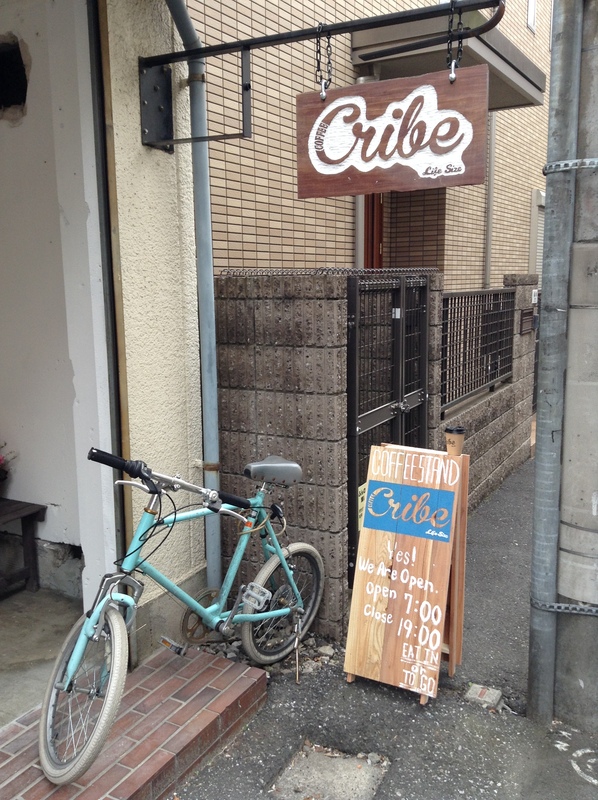 Cribe Coffee – worth the trip. Open 7 days a week from 7:30 a.m. to 9:00 p.m.
FoodEx Japan started today and runs through Friday. It is held at Makuhari Messe in Chiba. A few highlights included tasting through Finland’s Kyro Distillery’s portfolio. I had never tried a single malt rye whisky that had not been aged in a barrel yet, the Juuri. Lacking the tannins from the barrel it was brighter than I anticipated. Likewise, I had never tried a gin that had been aged in a barrel, Koskue, which was more complex than most gins. However, the barrel aging was only three months so the toasty notes were light and didn’t overpower the botanicals in the gin. The Verso rye is aged in small American barrels for six months and is well-balanced. A little spicy and sweet and not too overpowering. The Napue gin (not aged in a barrel) was soft and fragrant. Very approachable and while lovely on its own, I imagine it would be seductive in a martini. The gin is made with 16 botanicals, 12 dried and 4 fresh. The barrels used are made with American oak and are smaller barrels, 32 or 64 liters. I love the packaging and design and imagine that this brand could do well in Japan. I am told it will be sold at Hasegawa Liquors. I will update this post when I hear where it is sold retail in Tokyo. I met Mikael, Mikko, and Miika at the stand. If you go by, ask for Mi-kun (as all of their names start with Mi-), and tell them Yukari sent you. The distillery is brand new, only ten months’ old. I see the future as very good for them. 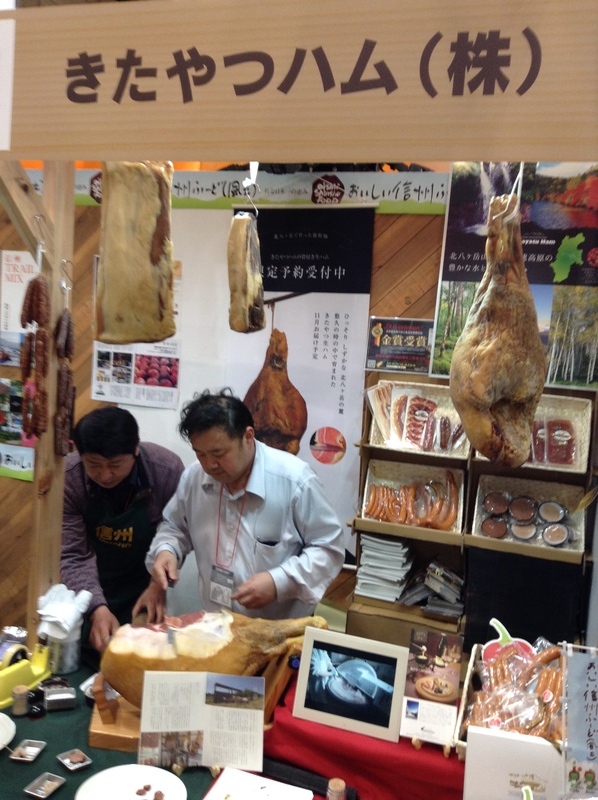 Kitayatsu Ham from Nagano was another highlight. The cured ham, sausage, and pates were all lovely. The Nagano Antenna Shop has recently opened in Ginza and I am told that their products are sold there, so will look for it there. These konnyaku chips were great and only have the calories of the seasonings as konnyaku has zero calories. 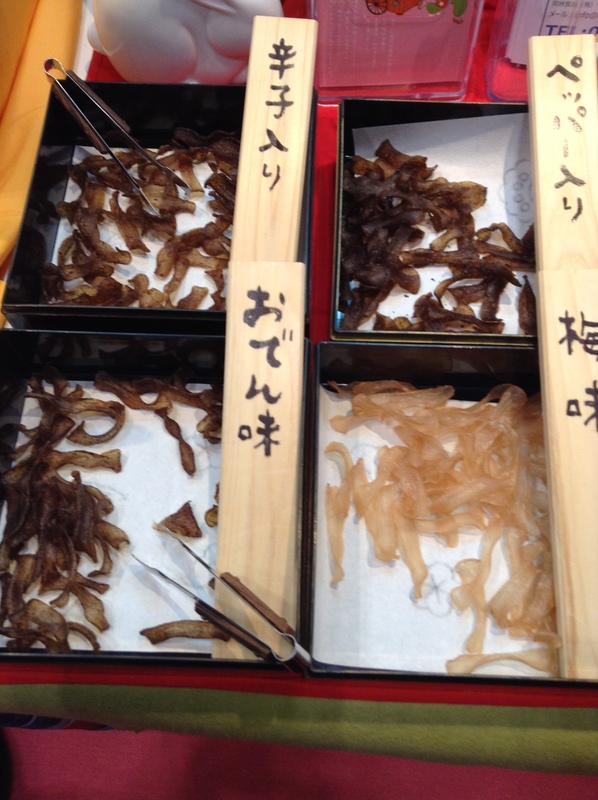 Flavors are pepper, chili pepper, oden, and ume (tart apricot). Okabayashi Shokuhin also had a thin sliced konnyaku that was nice when cooked up with soy sauce. The event hall is huge and there is more than one can see in a day. I wish I had more time to visit the sake, shochu, and other importers. There are some great speakers in the upcoming days including Kumiko Ninomiya Sensei of Ajinomoto, chef Nozaki of Waketokuyama, and chef Kondo of Koenji Sanukiya.